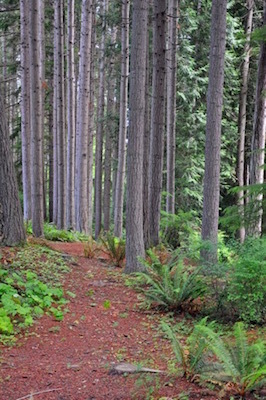 The Douglas-Fir Disease Is Spreading | Mr. Tree, Inc. There is a disease called Swiss Needle Cast which is spreading along the coast of the Pacific Northwest. This disease, native to the western United States but first discovered in Switzerland, is called a “cast” disease because it causes the tree to prematurely cast (or shed) its needles. The disease causes Douglas-fir trees to lose their needles prematurely, leaving the remaining needles looking sickly and yellowish. While the disease rarely outright kills the tree, it does reduce the tree’s growth, allowing its competitors to outgrow it and choke it out of its natural habitat. Swiss needle cast is caused by a microfungus called phaeocryptopus gaeumannii. This type of fungi reproduces using a type of spore called an ascospore. Ascospores can be found on the under side of needles, appearing as small black dots. What you are seeing is the fungus infecting the air pores of the needles. While Swiss Needle Cast does not seem to feed on any of the plants cells or do any other type of harm, clogging the air pores prevents the plant from taking in carbon dioxide or releasing water and oxygen. As a result of this, the Douglas-fir tree is severely weakened. The fungal spores are released from the needles as they fall during May and June and are spread by the wind and rain, where they infect other trees. For the infection to spread, the environment needs to be somewhat wet, otherwise the ascospores will dry out. The Douglas-fir is an important tree not only to the natural health of the forest, but to the local lumber industry as well. As the trees weaken due to the disease, all of the other species in the forest are affected too and the economy is harmed by the lack of quality lumber. Swiss needle cast seems to be increasing in severity, having started its spread around the west coast in the year 1996. In the past few years, it has spread more than 300,000 acres every year, more than ever before. In the state of Oregon, the disease has affected about one million acres and has reduced the growth of Douglas-firs by about 25 percent. Researchers are now studying why exactly this spread has increased so dramatically and have come up with a few theories to explain it. Since the disease spreads as a result of weather patterns, warmer climates may be one of the causes. When the climate is warmer, the winters tend to be more mild, causing the spring and summers to be more wet. This allows the fungus to survive and propagate more successfully. The other major factor in the spread of Swiss Needle Cast appears to be the planting of a monoculture of Douglas-fir trees that has taken place over the last few decades. In the past, the forests of the western United States boasted a lot more diversity among their trees, and as a result Swiss Needle Cast caused a comparatively small amount of harm. However, as new, younger Douglas-firs – all from the same monoculture and age group- were planted to replace lost trees, the forests have become more susceptible to the fungus. It is unknown whether climate change is a factor in the spread of the fungus, however the warmer climates and milder winters would be an expected result if this were the case. In the past, scientists theorized that only the younger trees were affected by Swiss Needle Cast. The belief was that trees aged between 10 and 30 years were the primary ones to be affected. However, based on studies of the rings of older trees, it appears that older trees are at just as much risk. In affected trees, the growth rate can be affected by as much as 85 percent. Scientists are attempting several measures to halt or control the spread of the fungus. Part of the problem is the difficulty in predicting Swiss Needle Cast’s impact on the local forests. While it’s clear the disease has done a great deal of impact to the Douglas-fir population, the long term consequences of this are more difficult to discover. Fungicides are one way to control the disease, but the expense is prohibitive and there is the potential that they will damage the environment if used in large quantities in the forests. Researchers are considering attempting to develop a new family of Douglas-fir that is resistant to the fungus; however it could take years to implement this plan. The other option is to reduce the planting of Douglas-fir and switch to other species of tree. Candidates include the western hemlock or red alder. In certain areas the western hemlock tree is already taking over as the dominant tree species as the Douglas-fir trees are choked out. It is possible that reducing the amount of Douglas-fir in forests may be the best way to control the spread of Swiss Needle Cast. Ultimately the disease continues to spread, worsening every year. Researchers from Oregon State University have studied this disease and ultimately concluded that much more research is needed to further understand the exact reasons why it has become so successful, and how to properly handle it.